i was sitting cross-legged on the sofa, minding my own business, when in walked my favorite animator to inform me that there was a thunderstorm warning in effect for the area. he went back to the studio to resume animation-related things, and i went back to minding my own business. a short while later—seriously, like ten or fifteen minutes—the sky began to darken rapidly, and it started to rain. 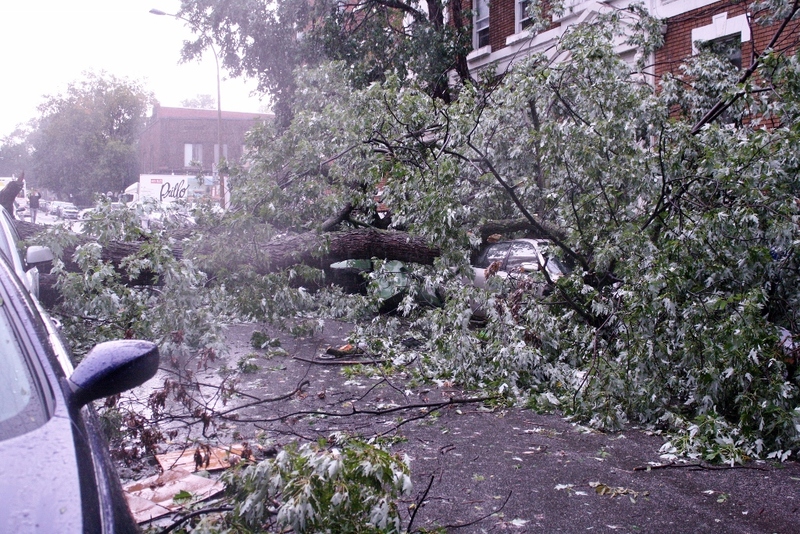 there may have also been a bit of wind, which grew windier by the second, until panic finally set in. me: uhm... sweetie, you need to come see this. seriously. hurry! now, having experienced a hurricane or two in my time, i recognized right away that this was no ordinary thunderstorm. we had crossed the line of "strong winds" and were careening toward that point where objects in the environment become projectile weapons. i was busy closing curtains to slow down the spray of glass should a window break, and he... well, he was busy standing right in front of the wall of glass in awe of the whole thing. then it happened. 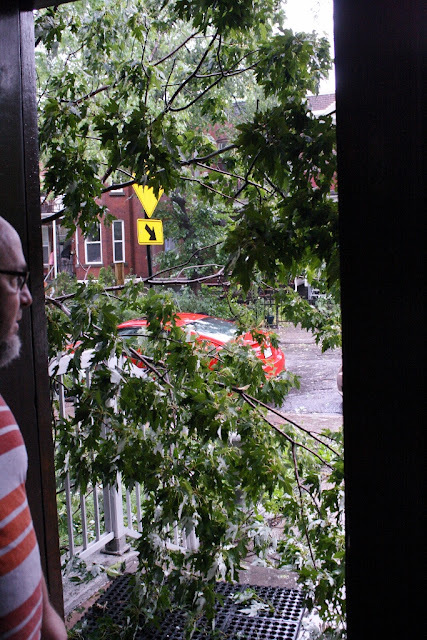 the top of the very tall, very old maple tree that shades our fourth-floor balcony from the sun most days, bent down suddenly and started smashing and scraping against the expanse of glass that occupies most of the living room wall. 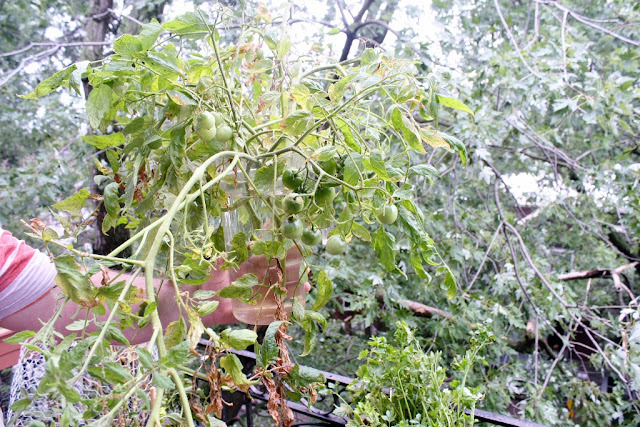 it was swishing back and forth like giant window washers from the sky, crushing most of our balcony garden plants in the process. 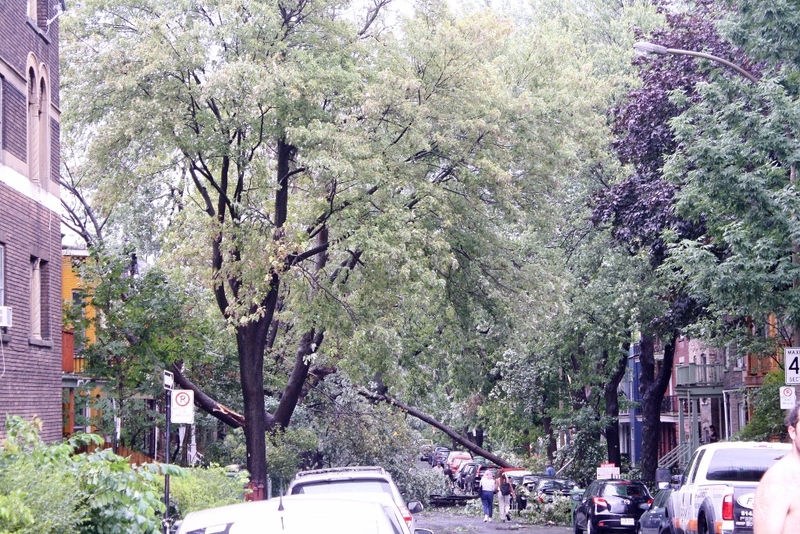 the large mass of branches and leaves landed briefly along the railing, then disappeared over the edge in the steady stream of gale-force wind. bye bye, shade-providing top of the tree. the lights flickered a few times, before going out completely, then—just as suddenly as it began—the whole thing came to a halt. no exaggeration, it must have lasted no more than thirty to forty seconds... thirty to forty of the most surreal seconds in my experience. we were left wide-eyed and open-mouthed in a state of total shock, while the sky outside shifted dramatically to the gentle spray of a normal Summer day's rain. what the...??? we took a quick walk around the place to make sure there were no signs of broken windows, then he went downstairs to get a closer look at the damage. the power came back on just long enough for him to call upstairs on the intercom about a minute later. him: throw on some clothes and come down here. you really need to see this. then the power was gone. i made my way down to the ground floor in total darkness, clutching the railing with one hand and my camera with the other. this was what greeted me as i approached the front door. see all that shrubbery hanging across the front entrance? that is part of the (former) top of the maple tree that was moments ago pressed against my fourth-floor walls and windows. there was more of it out of view to the left, up against the front of the building, and some of it was laying in the middle of the road. good times. we walked about a building or two up the street before i snapped out of the shock long enough to remember the camera. this was the view behind us. all of that stuff to the left and in the middle of the road is fallen greenery, most of it from our tree. note also, the tree a bit further down the block that is perched at a precarious angle over the street. that one was standing up straight just a few minutes before. and that was nothing compared to the view looking the other way. note the police car parked at the intersection to prevent any vehicles from foolishly trying to enter our block. 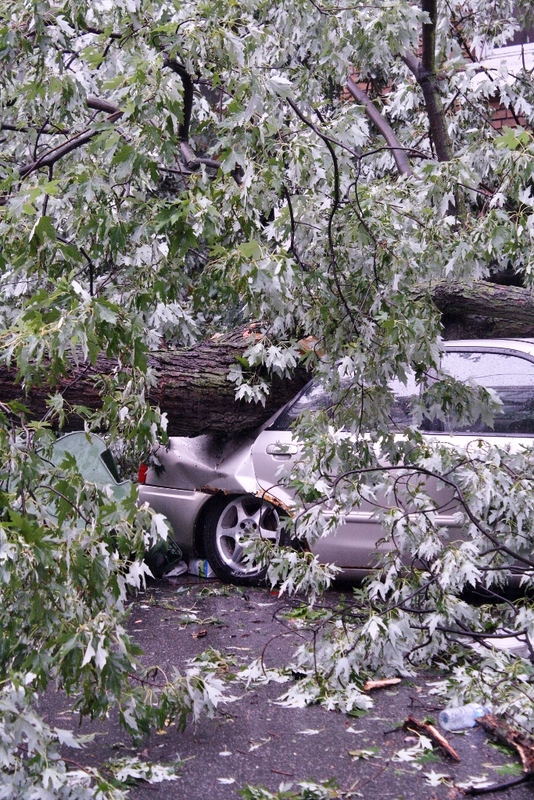 the lesser damage was this smaller tree that fell across the hood of a car. but the greater damage came from this ancient tree, which managed to crash-land across a total of four cars, with minor damage to a few other vehicles in the immediate vicinity. 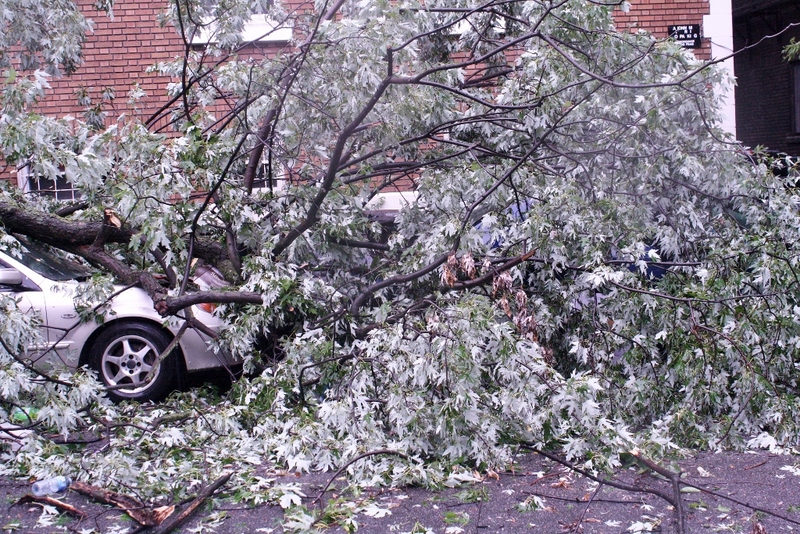 most of the damage was done to the three cars parked directly across the street. the car in the middle took the worst of it. there is another car somewhere behind that line of green recycling bins buried beneath that mound of green, and they used to (also) be across the street. and if you look closely, you can see a navy blue car somewhere in all that green. we spoke briefly with the owner of that one, and he was pretty chill about the whole thing. no one was hurt, and that really was all that mattered in the end. this was a particularly old tree of the type that is frequently described as having 'lots of character'. see what was left behind? turns out that "character" was not the only thing it possessed. this (mostly) hollow old tree was host to all sorts of secret activity. 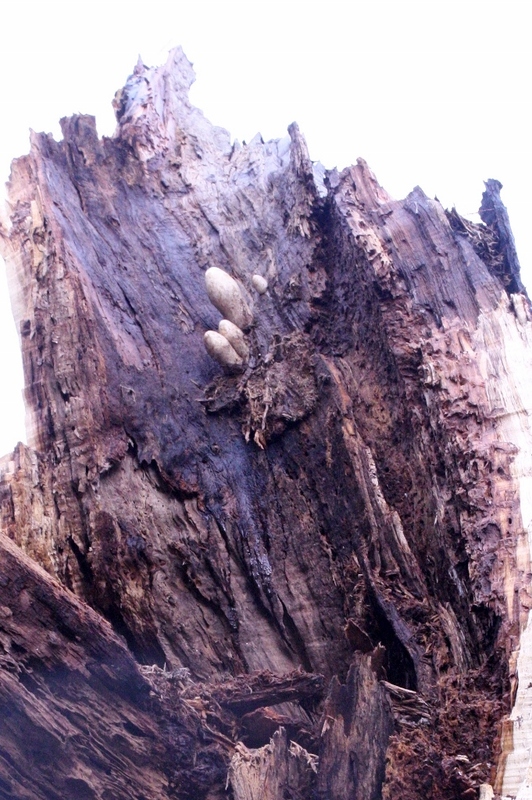 i am still trying to identify the potato-like fungi growing on the decayed wood. the largest one in this cluster was the size of one of those freakishly-gigantic potatoes you often find baked and stuffed with enough toppings to feed a small village. then there was the nest made up of shredded bits of... everything. i do not want to know what creature called this home, but i sincerely hope (s)he does not come looking to move in to our tree. we lingered for a bit, chatting with folks along the way. again, no exaggeration... i met more of my neighbors in that short time than in the entire two-plus years that we have lived here. i spoke to the lady in the apartment next to ours long enough to be able to identify her in a police lineup. i also (finally) introduced myself to the old lady (and her husband) from down on the second floor. we always refer to her as "the old Caribbean lady who cooks all the wonderful food you smell when you walk up the stairs". i even found myself nodding and laughing while she compared our crazy storm to Hurricane Janet (a legendary hurricane that inevitably comes up in conversation when speaking of storms to any Caribbean person of a certain age... by which i mean, old people). we arrived at the head of the block, and we were about to turn back and go home, when someone asked if we had seen the local park. "trust me," he said, "you need to go see it," so we continued walking in the light-rain over to the park. we passed a few scenes like this, where a downed tree rested against the facade of a building. 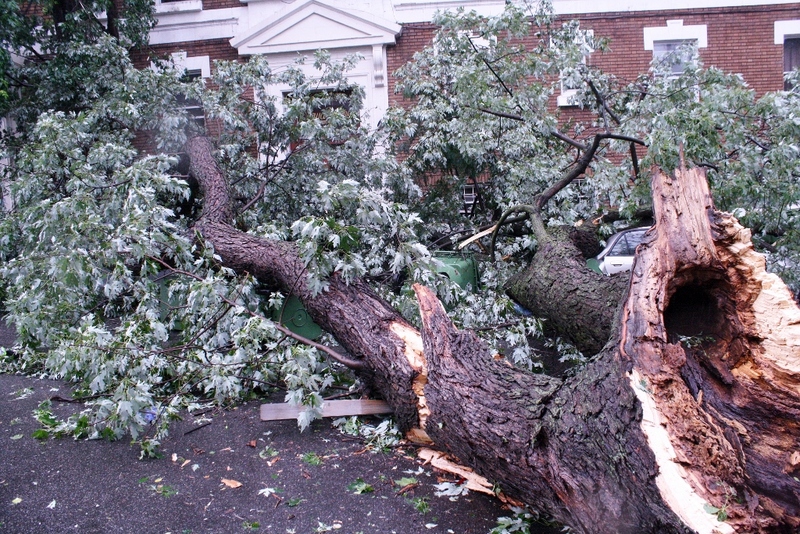 the building was usually across the street from where the tree used to be. 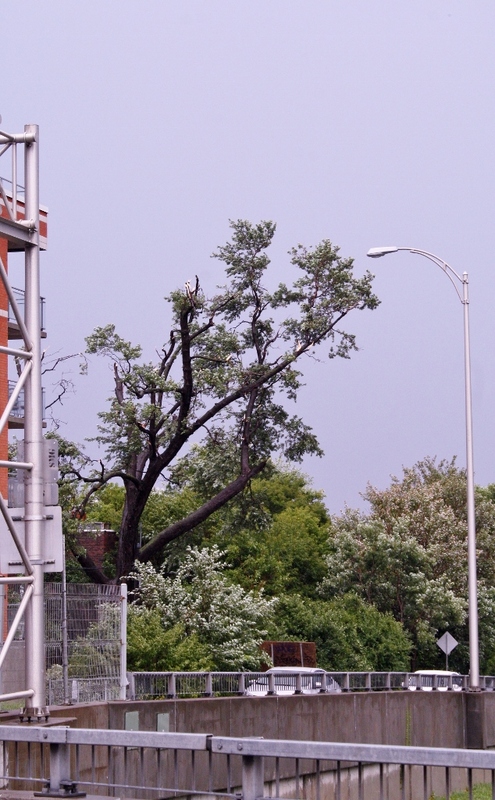 there was also the remains of this tree, which we spotted as we were crossing over the local expressway. this is a tree i look at almost every day, as it stands directly behind one of the lovely two-story houses across the street from our place. 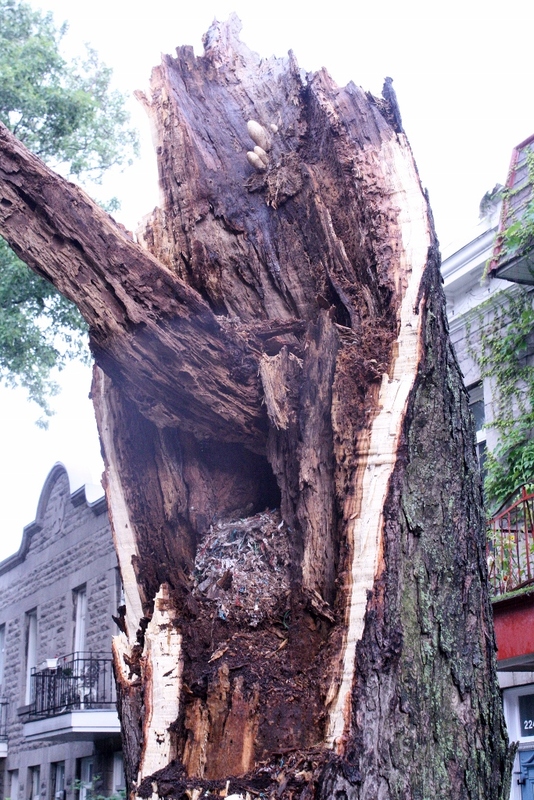 the top of the tree did some serious damage to their roof, prompting the fire department to declare it unsafe. they were given a few minutes to pack up some belongings before they had to vacate the building. still, no one was hurt, and that is always the most important thing. the scene at the park was even worse. this was the first thing we saw as we approached the nearest corner. all the stuff that looks like bushes or shrubbery is in fact the parts of (or, sometimes whole) trees that were knocked to the ground. there are very few hedges or shrubs in this park. all of that is stuff that used to be up in the trees. i have tons of photos taken from my balcony of the sun setting behind what used to be a truly impressive line of large old trees. such a shame. 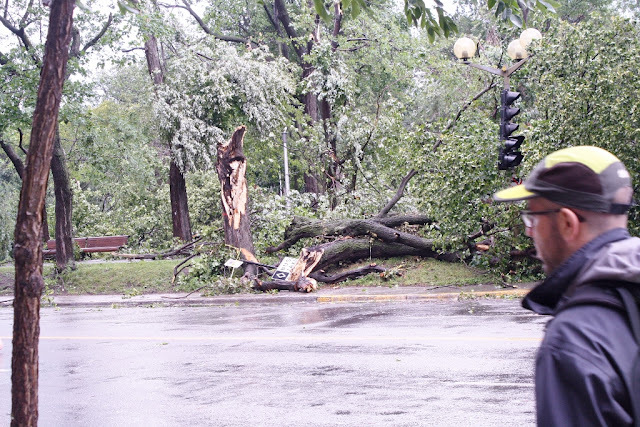 there were countless piles like this one, with road signs and even traffic lights mixed in between all the mangled tree remains. 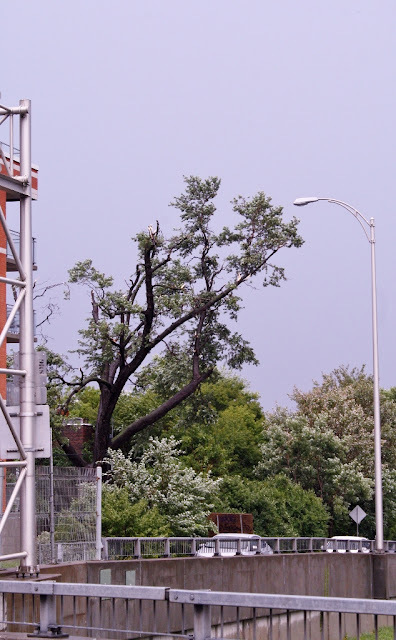 most of the older trees were either knocked entirely to the ground (like the one laying horizontally on the ground here) or damaged to such an extent that the city will likely have to chop them down. this is the recently-renovated, complete with new walkway, south entrance to our humble little park. common sense had to prevail over curiosity, so we only got as close as watching from across the street, but there were a few people who could not resist the temptation. 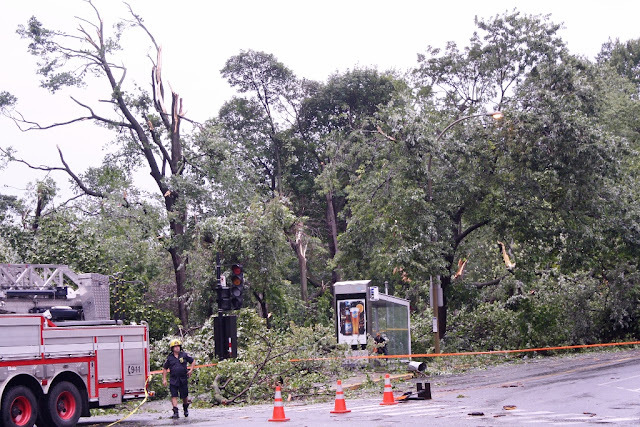 emergency workers were spread thin trying to keep the gawkers at a safe distance, as there were countless hazards everywhere. 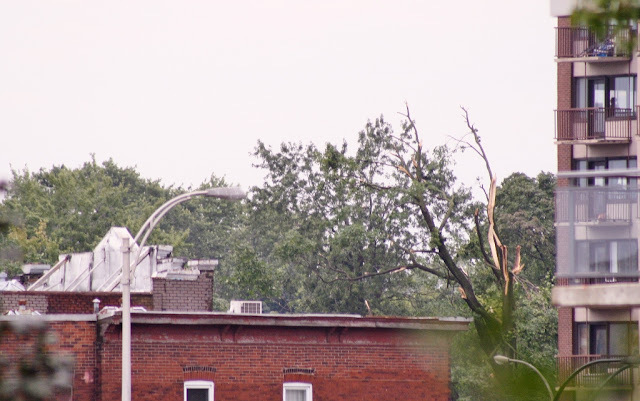 for example, this was part of one tree that was hinging upside down from another tree, suspended only by a small length of old power line. seriously, people... common sense! we eventually returned home, rain-soaked and still in shock, to take a closer look at the damage to our garden. needless to say, it is pretty much done with for the year. the sweet peppers and chilies took a beating, but they were mostly okay. i rescued a few branches of tomatoes and put them in water in hopes that the tomatoes will begin to ripen before they begin to rot. there were so many broken branches dangling from our tree, that it was marked as a high-priority and the area below it was marked off with caution tape... which everyone proceeded to ignore as they went up and down the street. i actually yelled at one kid who ducked under the orange tape, and was about to walk under the thickest clump of overhead debris, then his mother showed up a few seconds later (pushing a baby in a stroller), and proceeded to do the same thing... so i had to yell at her too. self-preservation seems to be in short supply these days. a truck arrived just before sunset, complete with a dishy chainsaw-wielding arborist and one of those hydraulic cherry-picker contraptions that lets you get up into the top of large trees. he worked quickly to remove the worst of the damage in the waning light, and we gave him a smile and a cheer when he finally packed it in just as the sun was disappearing from view. the power came back on some time later, and i started to saute the ground beef that was going to be the base of our planned quick-dinner of beefy nachos with cheese. naturally, the power went out again before i could get that done. he mentioned something about finishing cooking the meat on the grill, but i opted for the fondue pot. so we ended up with an unplanned candlelit meal of a Tex-Mex cheesy-beef fondue, and i may have consumed a few too many boozy ciders before eventually falling asleep. the power came back on shortly before dawn, and we turned out the lights, and went right back to sleep. 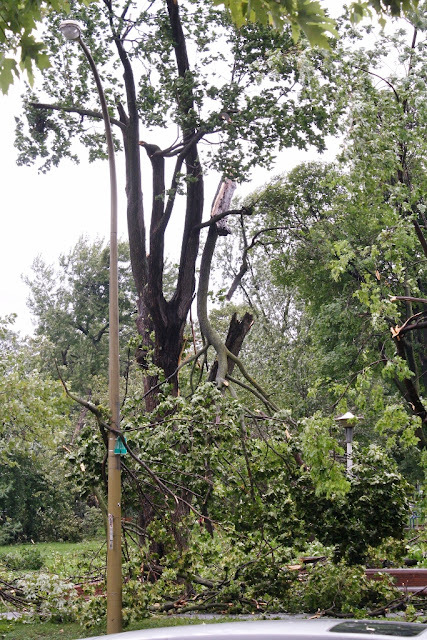 turns out there were over a hundred crews working through the night to get the power restored to this part of the city. all that fuss for an atmospheric disturbance less than a minute long. crazy. it was officially categorized as a "microburst". they are typically smaller than tornadoes, but quicker, and potentially more powerful. it is like an air bomb a few kilometers wide. 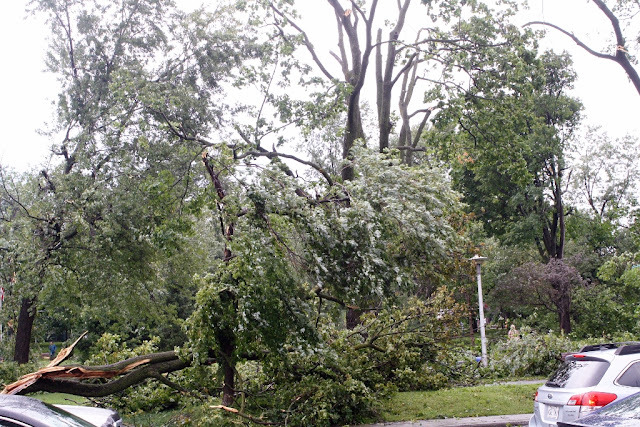 we came across many people who were not in the immediate area during the brief storm, and they had no idea this had happened until they saw the damage first hand. most of them made comments like, "it looks like a bomb went off across the whole neighborhood". insane. 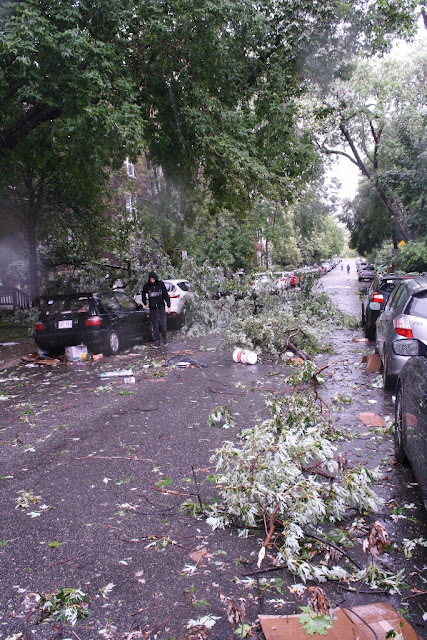 it is almost a week later, and there are still piles of downed branches occupying parking spots along the street. they cleared all the greenery from the large trees and moved the massive trunks to the edge of the sidewalk (blocking even more parking spots), and the same is true for most of the neighborhood. 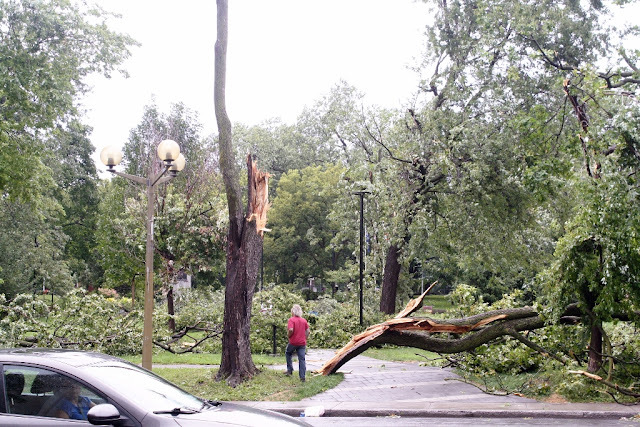 the park still looks like a disaster area, though people are ignoring all of the fermé (closed) signs to go rambling through the fallen trees. the cleanup will take time, but i have not heard of anyone being seriously hurt (and that—as i keep noting—is all that really matters in the end). still, i am going to miss looking out at that huge tree at the corner of the park when i open the drapes to start each new day. 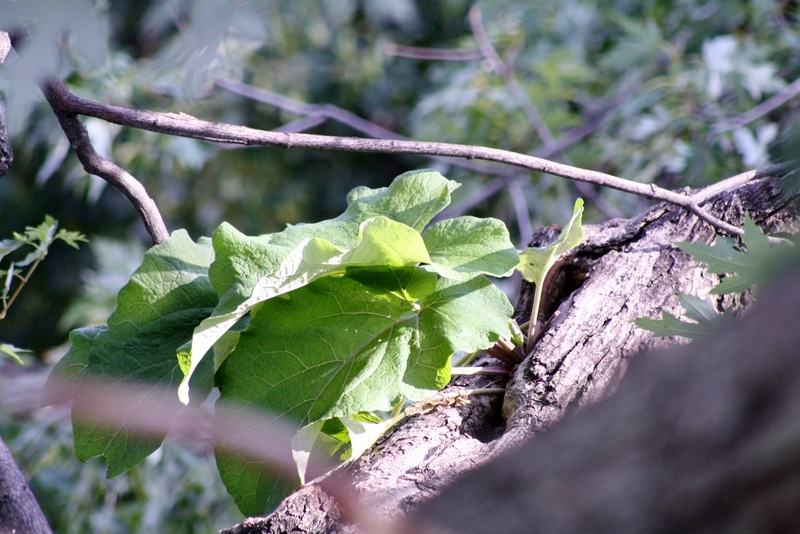 my favorite animator spotted some strange, large leaves outside our bedroom window on the morning after the storm. i am still trying to figure out how that burdock got there. seems like the squirrels had their very own balcony garden hidden up in the canopy of the old maple. i am officially afraid. oh, what a mess. I mourn for your plants, for the squirrels (really) and the trees. It does look as if that tree with the nest inside was ready to go anyway, so that may have been a blessing. 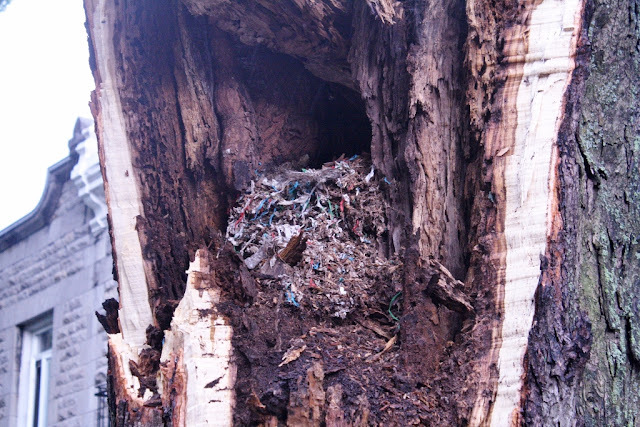 That nest may have belonged to a rat family, or squirrels. Best not to inquire too deeply. Or maybe take a rake and see what could be squirreled (sorry) away inside. 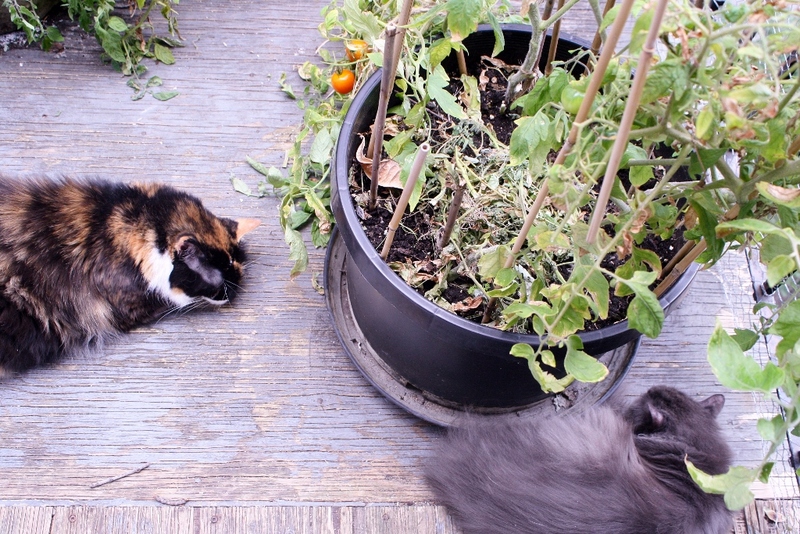 I think cats have the right attitude: not our fault, we can't do anything about it, let's have a nap. 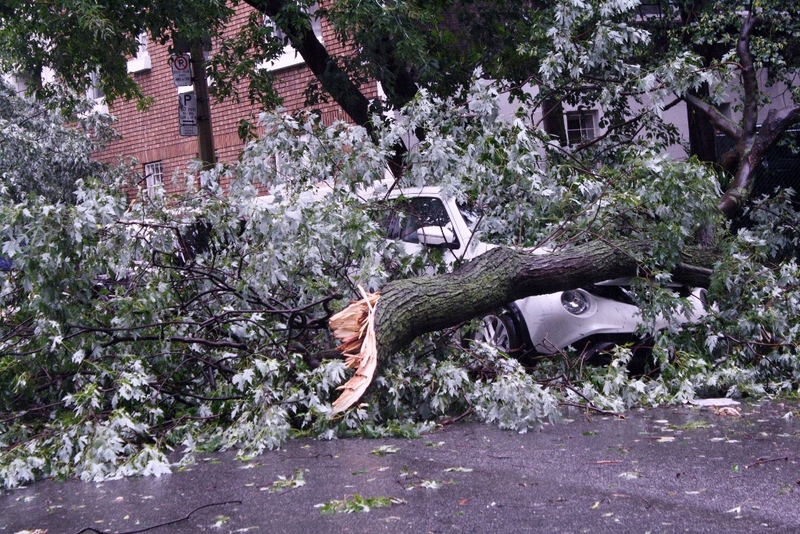 there are still piles of tree parts all over the neighborhood, but everyone's taking it in stride, especially when you consider how much worse it could have been. the season for outdoor construction work is pretty short around here, so the biggest concern will probably be getting all of the repair work done before the cold sets. 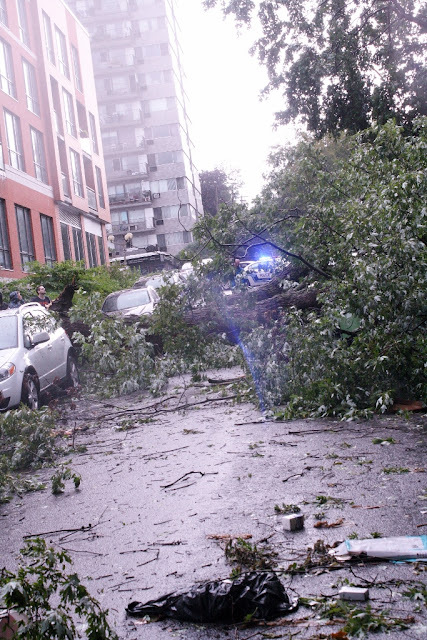 still, a few downed trees is a non-issue compared to the stuff going on elsewhere. we are all just thankful that everyone's okay.